Showing results for tags ' quad'. For you sport quad guys! 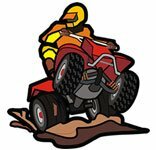 Do you prefer to have a sport quad for? 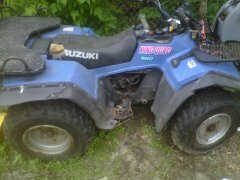 I have a 2008 Suzuki King Quad 750 axi. I have a problem with the machine over steering. I purchased it used, it had hit a tree and was rolled. Everything is now back in place and there does not seem to be any damage left. But the machine is incredibly hard to handle as any minor movement in the steering results in major over steering. The steering also has a very light feel, meaning it takes very little effort to turn. Making one hand driving almost impossible. Does anyone know if this is a common symptom of a crash that involved a front wheel damage? Is there an adjustment on the steering that could help resolve this issue? need help on picking what quad to get. i have a warrior 350 and looking to upgrade. i either want a trx 400 or a trx 450. but i feel like im going to grow out of the 400 so fast. but 450 i feel like the 450 will be to powerfull. plz help!!!!! JackThompson899 posted a topic in New Members Area! Working on learning to maintain and repair my 2 quads with my son. Gives us something to do together and allows us to have a new hobby (quad riding) that we can afford. Over the last 2 years I've picked up a 1986 Honda TRX250 and a 1999 Yamaha Bear a tracker 250. We've rebuilt carbs, replaced starter pull cords and done basic tune ups. As things get more complicated and repairs start looking more involved hopefully we can find some answers here. Thanks! Off to look around here now. Picked up this 50cc quad, what is it???? gbforever2001 posted a topic in General Talk - Anything Goes! Hey all, new to the forum. This quad I picked up for pretty cheap has no markings, labels or anything, need to get some support information about it if anyone can help. Thanks!